Of course baseball season is in full swing, but this time of year is also big for vintage baseball games. Around the country, teams form to recreate classic old-time baseball, the way it was played in early in the twentieth century and, better still, in the mid- and late-nineteenth century. This recent vintage baseball game in Ohio took place in an old prison yard, making a unique, but impressive, setting for a classic game. Though the doubleheader featured two landslides, the lessons in the way the game used to be played were the real reason to pay attention. From uniforms to language, the players and umpires (and even the fans, in a way) remained true to every detail. Including playing without gloves, and fielding balls on the bounce. For an out. Makes me wonder what it’d be like if they really started playing that way today. Some great photos came up on Keyman Collectibles, great reading and looking for fans of vintage gloves and old game-used equipment. 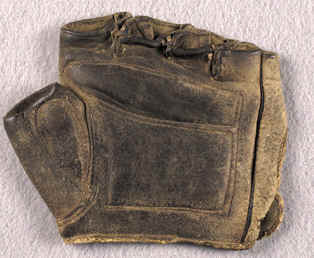 One of my favorite images (and background stories) is the old fingerless glove from the late nineteenth century. These vintage gloves, perhaps better designed for knocking balls down than for snagging line drives, can go to collectors for high four–figure and low five–figure prices. There’s nothing like holding and owning classic equipment, but a good (free!) look through the online images is a good look back on the old game. With opening day around the corner, I have my eye on the future. A clean slate for every teamâ€”technically a shot at the playoffs for everyone.Â But today I’m taking a step back to think about history a little bit too, with a hat tip to Stan Schulz. Stan found the original Rawlings glove patent on Google’s patent search. Perhaps the best part of the Google patent page is original drawing of what this first glove would look like. Today Rawlings gloves are of course a major player in the industry. But the roots of the gloves worn by Albert Pujols, Derek Jeter, and Jose Reyes go all the way back to this seemingly simple document. If the patent images spark the history buff in you, check out more about baseball glove history.